RDL Flat-Pak products are constructed in compact, low-profile, shielded, heavy-duty metal chassis. They can be directly screwed or bolted to cabinets or shelves. Accessories permit mounting single or multiple modules to front or rear rails, while adjacent mounting of modules is facilitated by 'daisy-chaining multiple modules from a single power supply using included power interconnect cables'. The series provide 'the most common connections in professional installations', including 'gold-plated jacks, detachable and fixed terminal blocks'. Bold, high contrast labelling 'facilitates connection and adjustment in confined or dark locations'. LED metering and indicators shorten setup and adjustment time. A single-channel level controller for balanced or unbalanced line-level signals, with detachable terminal block connectors. Output level is nominal 4dBu with>18dB headroom and input levels can range from -16 to +14 dBu, with a single gain control and overload LED for adjustment. Control circuitry has self-adjusting attack and release times and split-band AGC circuitry. Input impedance: 10k ohms; output impedance: 150 ohms; frequency response: 20-20,000 Hz (+ or - 0.75dB); THD <0.15%; noise: <-90dB (below +4dBu). Supply 24V 80mA. Dimensions (l x h x w): 157 x 33 x 83mm. Two and six channel unbalanced to balanced converter/ pro interface for replay only machines such as CD players. Input connectors are gold plated RCA (phono) and output connectors are gold-plated XLR connectors. A gain adjustment (-5dB to +10dB) control is provided for each channel. Input: 10k ohms unbalanced -20dBV to -5dBV; output: 150 ohms balanced or unbalanced (drives 600 or 10k ohms loads); frequency response: 20-40,000 Hz (+ or - 0.25 dB); headroom:>18dB at +4dBu output; THD: <0.05%; noise: <-85dB ref. +4dB; crosstalk:>70dB. Supply 24V 50mA. (UBC2) 75mA (UBC6); Dimensions (l x h x w): 99 (UBC2) 213 (UBC6) x 30 x 83mm. Each output is equipped with a recessed microphone/line switch that provides 50dB of attenuation to feed the microphone input of a mixer-amplifier or other equipment with microphone inputs. Outputs mute when the digital audio inputs are inactive. Optional accessories: A variety of mounting brackets and adapters. 57-402, an 'RDL PS-24AX POWER SUPPLY Universal, 24 volt, 500mA, UK plug' is a suitable power supply. The models differ principally in the powering arrangements and whether a facility for remote volume control using a VCA is fitted. The FP-NML2 is powered from an external 24V DC power supply, available separately. It has a DC output socket and extension cable that allows it to be operated from a common power supply with RDL Flat-Pak amplifiers. One audio output connects to the Flat-Pak amplifier input, and the second output may be connected to an additional amplifier. This is equipped to operate from a POE enabled network switch. The FP-NML2P will reserve power from the switch even while being powered from an external 24V DC supply. If POE power and an external 24V DC supply are both feeding an FP-NML2P, the unit will run from the external supply but will switch over to POE power upon loss of the external supply. 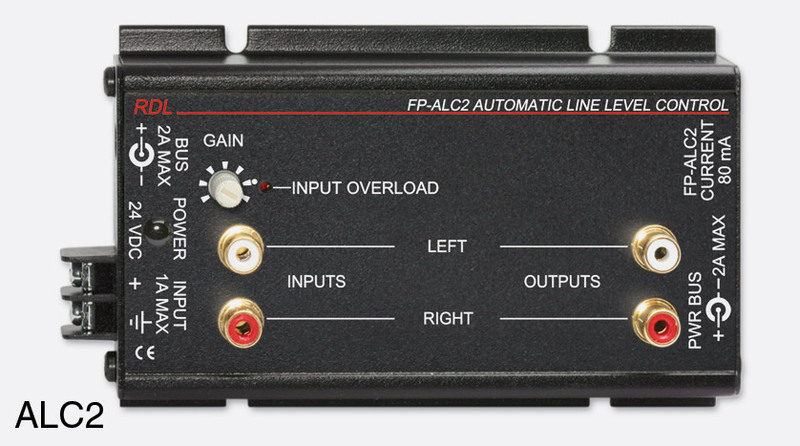 Each output of the FP-NML2V is equipped with a VCA for remotely adjusting the output level. Separate remote controls may be used for each output, or a single remote control may be connected to adjust both outputs simultaneously. A second detachable terminal block provides for two 10V and ground feeds out to a level control, with two return inputs, one for each channel. It is powered from an external 24V DC power supply, available separately. It has a DC output socket and extension cable that allows it to be operated from a common power supply with RDL Flat-Pak amplifiers. One audio output connects to the Flat-Pak amplifier input, and the second output may be connected to an additional amplifier. 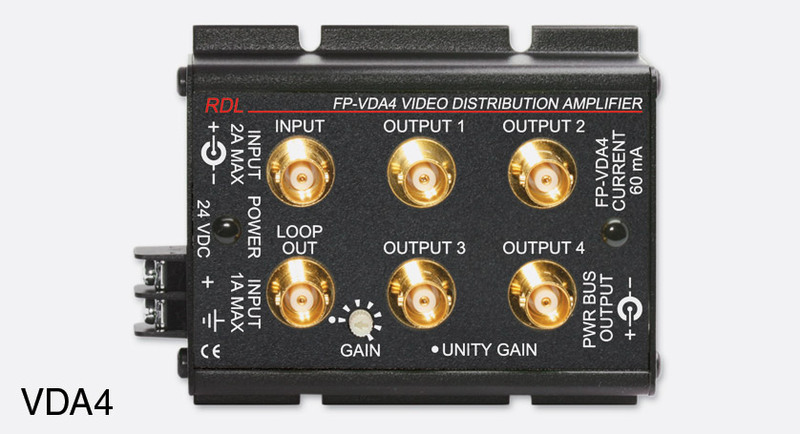 Each output of the FP-NML2VP is equipped with a VCA for remotely adjusting the output level. Separate remote controls may be used for each output, or a single remote control may be connected to adjust both outputs simultaneously. A second detachable terminal block provides for two 10V and ground feeds out to a level control, with two return inputs, one for each channel. It is equipped to operate from a POE enabled network switch. The FP-NML2VP will reserve power from the switch even while being powered from an external 24V DC supply. If POE power and an external 24V DC supply are both feeding an FP-NML2VP, the unit will run from the external supply but will switch over to POE power upon loss of the external supply. Designed for use in hospitality systems and to interface between hotel room televisions and multiple Format-A receivers. The Format-A audio sender accepts a stereo line-level input via dual RCA (phono) connections, or a fixed-level 1 to 3watt amplified signal via a balanced 3.5mm jack socket. 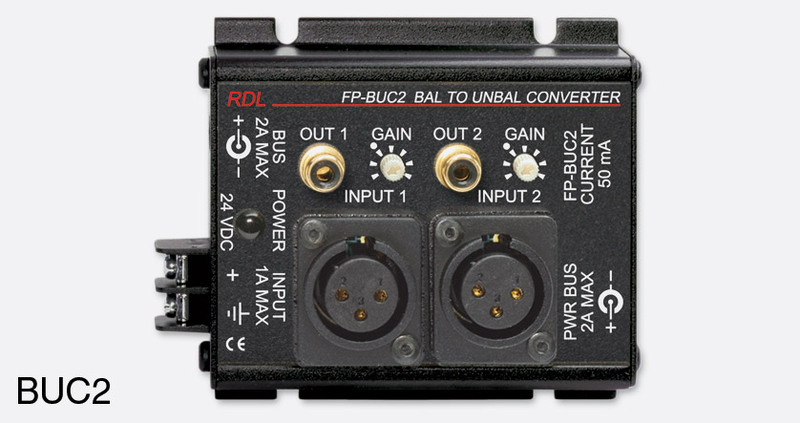 The unbalanced line input signal is sent over balanced twisted-pair cables on pairs B and C, whilst a mono amplifier input signal is also conveyed on pairs B and C.
Powered via optional 24Vdc power supply which will also provide power to the connected sending/receiving modules. An LED positioned on the front of the unit indicates the FP-TPS4A is receiving and distributing 24Vdc to all three RJ45 connections. The distributed DC output voltage is short-circuit protected by way of automatically resetting fuse. Three-channel mono mixer with unbalanced/balanced line level inputs and outputs. Input and output connections are via separate and removable terminal blocks. Two unbalanced RCA (phono) output connections are also provided for connection with a stereo amplifier. There are three VCA level controllers for the input channels. A two-LED level indicator is provided. Line input level: -20dBV to +8 dBu. Output level: RCA -10dBV unbalanced; terminal +4dBu, balanced. Frequency response: 20-20,000Hz + or - 0.25dB. THD+N: <0.05%, 20Hz-20kHz; <0.02%, 1kHz. Versatile, single-channel, utility building blocks in the popular Radio Design Labs ‘Flat-Pak’ packaging, which will mount directly to surfaces or using a range of mounting options. Inputs are electronically balanced and both eight ohm and 70/100V line models are offered, both powered by external 24 volt supplies, solving many varied requirements in most audio engineering environments. All models feature a compressor, automatically adjusting to avoid clipping and maximise audible level from the power available. This mono power amplifier with automatic energy-saving sleep mode, offers 18W RMS into an eight ohm load. 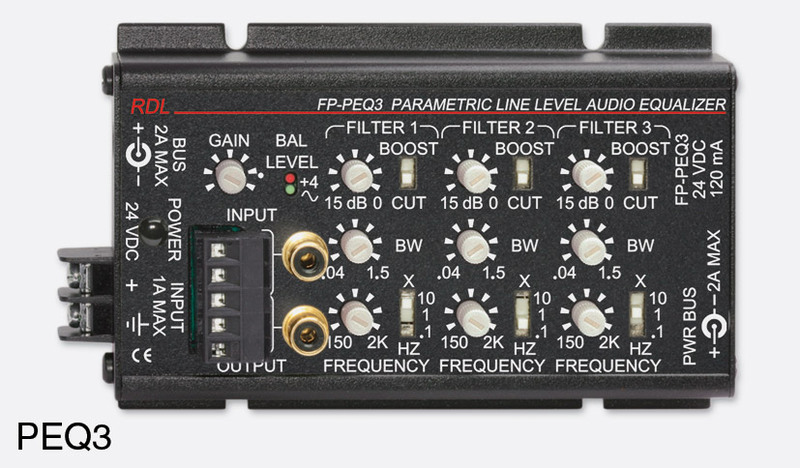 This Class-D amplifier offers a sleep delay that is programmable to Off/5/15/25mins by way of sunken rotary control on the side of the FP-PA18. A gain control is located next to the I/O terminal block and can be adjusted using a trimming screwdriver. A red LED indicates when the output is 3dB below the rated output and the compressor is employed. The compressor has automatic attack and release adjustment. A green LED illuminates when audio is detected and when the amplifier provides an ‘active open collector’ output. Finally, a blue LED illuminates when the FP-PA18 is powered from its external 24Vdc power supply. The same LED is ‘dimly illuminated’ when the sleep mode disables the amplifier. Input: Nominally +4dBu / -10dBV, minimum (to cross compressor threshold) -18dBu / -20dBV, maximum +23dBu / +21dBV balanced / unbalanced. Compressor threshold: 3dB below rated output. CMRR: better than >45dB, 50Hz-3kHz. Response: 20Hz - 20kHz +/- 1dB*. Distortion: less than 0.5% at 20Hz - 20kHz respectively*, THD+N. Output: 18W RMS, 8ohms load. Power source: Dimensions: 82.6 x 76.2 x 29.2 (w x l x h) mm. (*at compressor threshold level equivalent to 12W RMS output power). The FP-PA20 offers an output of 20W RMS into an eight ohm load. Audio levels that could cause the amplified output to clip are compressed according to two dynamic time constants. Normal audio level signals remain unaffected by the compressor thereby preserving audio dynamics and preventing the compressor from increasing feedback potential when the amplifier is used for paging. The compressor is designed to remain aurally transparent while maintaining clean, un-clipped amplified audio for input overloads of up to 20dB. Average audio levels and audio clarity result that are normally expected of amplifiers delivering much higher output power. Built in a black extrusion, the amplifiers have gain control and LEDs for power and peak level. Connections are by detachable terminal block. A co-axial connector provides an alternative connection for the DC power input. For full RMS output power, a 24V DC 2 amp power supply is required. A 1 amp supply is sufficient for normal program audio levels and content. Order power supply separately. Input: Nominally +4dBu / -10dBV, minimum (to cross compressor threshold) -26dBu / -28dBV, maximum +23dBu / +15dBV, 20kohms / 10kohms, balanced / unbalanced. Compressor threshold: 6dB below rated output. CMRR: better than 55dB, 50Hz-120Hz. Response: 35Hz - 50kHz +/- 1.5dB*. Distortion: less than 0.1%, 0.5% at 1kHz and 50Hz - 20kHz respectively*, THD+N. Output: 20W RMS, 8ohms load. Power source: 24V DC, 2A, ground referenced, for continuous 20W RMS power output; 24-33V DC, 1A for normal programme material with minimal compression. Ambient: 0-30°C, (20°C recommended). Dimensions: 82.6 x 153 x 58.5 (w x l x h)mm. ( *at compressor threshold level equivalent to 4W RMS output power). The FP-PA20A offers an output of 20W RMS into 70V or 100V lines, highly applicable to local zones in multi-zone PA installations. It is essentially similar to the FP-PA20, but has three output terminals for common, 70V 100V. Specification is the same as the FP-PA20, except for the following. Response: 50Hz-20kHz +/- 3dB*. Output: 20W RMS, 70V or 100V line load. The Flat-Pak range all have the same width, with mounting flanges that offer a variety of fixing options. 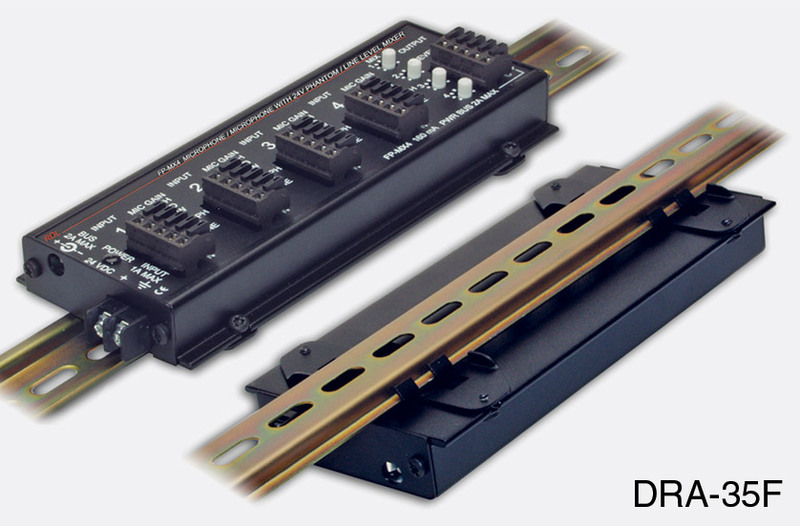 The flanges have notches for simple fixing to a surface using screws and, using special mounting brackets, can be slotted onto RDL 2U rack-mounting panels. Powering: All units require a 24V DC power supply; each has both screw terminals and coaxial socket for power input and an additional coaxial socket to feed supply to other modules. A 'universal' supply is available, 57-401, with 24V 2A output, which requires an IEC cordset. 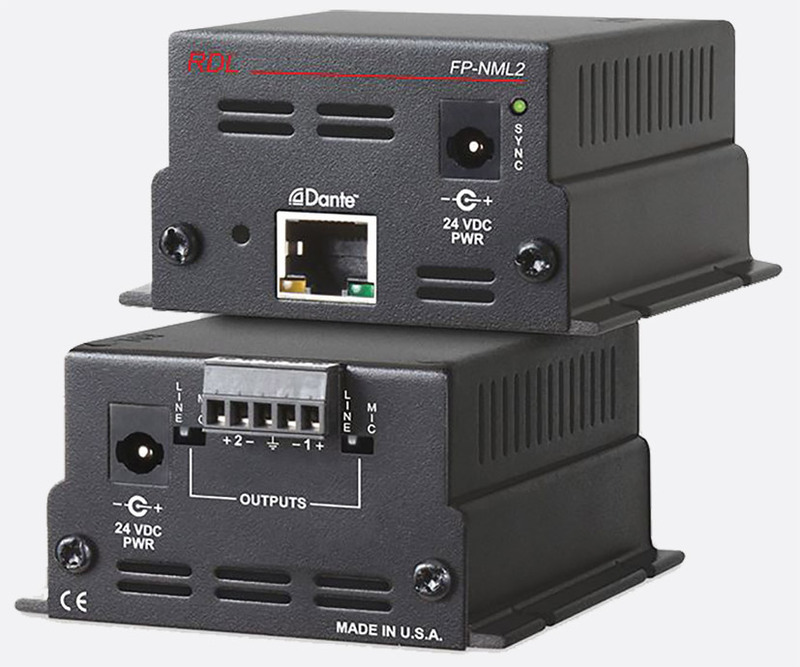 See RDL POWER SUPPLIES for further information and a variety of mounting options. 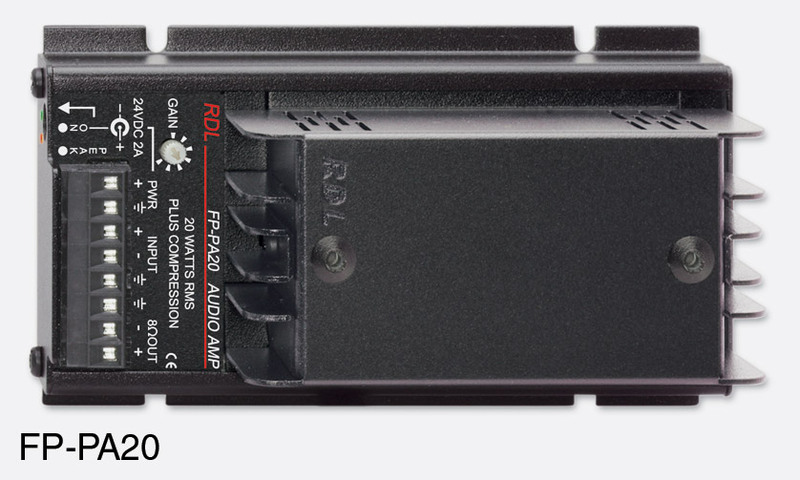 Note that all RDL modules with co-axial power input/output sockets use connectors with 2.5mm pins. Ordering note: All modules are supplied with a datasheet and a power interconnection cable, to cascade power to another module.